The Central Government of India has launched a new scheme ‘Sankalp se Siddhi – New India Movement’ on the occasion of 75th anniversary of Quit India movement. This is an integrated yojana for the betterment of the nation by 2022. “Sankalp Se Siddhi- the Attainment through Resolve” is the theme of the New India Movement for 2017. The program was organized by Sri Ramalinga Sowdambigai College of Science and Commerce of Coimbatore on 12th August to take forward the initiative in the presence of the Minister of State for Culture and Tourism Dr. Mahesh Sharma. The aim of the movement is to take an oath for making a new India, which would be free from corruption, Terrorism-, Communalism, Casteism, poverty and all other negative aspects. Sankalp se Siddhi is 5 years plan, The Prime Minister of India addressed the collectors of all the districts of India to start the New India Movement from the grass root level. 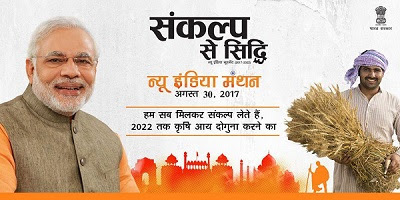 This scheme will focus on 6-7 major issues like Clean India, Literate India, Poverty Free, Corruption free, Terrorism free, Communalism free, Casteism free India. Which will be raised through various events under the scheme. Under this program, events and other social activities will be organised, the authorities will make the citizen aware of many issues. Also the representatives of every district must set a goal for the betterment of their respective districts. Within the stipulated period, every deficiency of a particular state must be resolved and the necessary services like water, electricity, health and education be provided to the districts. The District Collectors must prepare a Vision or Resolution Document with the help of intellectuals, colleagues and students of the state and should work accordingly to that to achieve the goal in 2022, also create awareness among the people regarding the LED Bulbs, BHIM Apps, Swachh Bharat Abhiyaan and must encourage public participation in these activities. There are 18 state that have enlisted under the scheme, Andaman & Nicobar, Telangana, Tamil Nadu, Kerala, Maharashtra, Gujarat, Rajasthan, Madhya Pradesh, Chattisgarh, Odisha, Bihar, Uttar Pradesh, Haryana, Himachal Pradesh, Punjab, Manipur, Nagaland and Meghalaya. This programme will help lower income group especially poor farmer to earn double.